Another de-cluttering find - a stash of stickers. I don't remember buying them so I have no idea where they came from! I'm thinking they came with one of her many gifts. Hopefully they didn't accidentally drop out from one of the Activity Kits! Bubbles was thoroughly engrossed in peeling off the stickers one by one and sticking them on her cot railings. 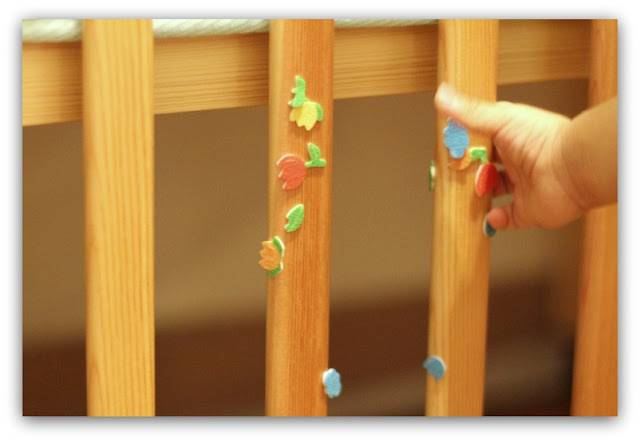 These stickers are made of foam so they don't easily tear or crumple, making them suitable for toddler hands. I thoroughly enjoyed watching her do this! Her look of concentration was just too adorable. Unfortunately I didn't manage to get a good pic so I won't bother posting. It will be stored in my memory bank! I let Sean play with some old stickers in the car once and he would SCREAM in frustration each time they got stuck to his fingers!!! There must be reason why most of us grew up with sticker albums! :) That said, my Bubbles loves 'peeling' off stuff. I once caught her peeling off price-tags at the bottom of shoes at a shoe shop! That happens to Bubbles too with those flimsy/easily tearable stickers. Like you, I also first dug out old sticker for her to play with and discovered how frustrating they can be for her =P These foam ones work really well though!